Journey to the seemingly idyllic world of Native Hawaiians, where communities are surrounded by experimental test sites and pesticides sprayed upwind of their neighborhoods. Poisoning Paradise details the ongoing struggle to advance bold new legislation governing the fate of their island home. In an attempt to diversify an economy that was overly reliant on tourism, policymakers in both Hawaii and Washington, D.C. encouraged the world’s largest biotech companies to utilize Kauai’s favorable climate and fertile soil to test genetically engineered seeds and crops. 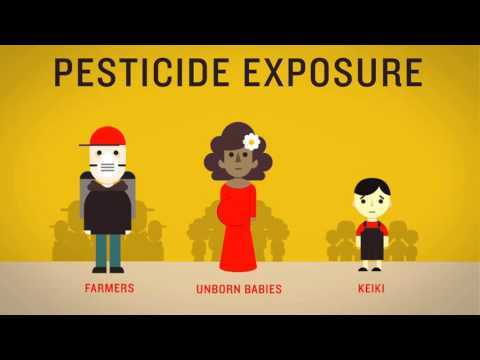 Corporations including Syngenta, Pioneer DuPont, BASF, and Dow Agrosciences have since applied hundreds of tons of Restricted Use (RU) pesticides on thousands of acres across the Garden Island’s West Side, the traditional homeland of an indigenous and disenfranchised population. As champions of a grassroots movement to make Kauai County Bill 2491 law, local activists battle political corruption, corporate bullying, and systematic concealment by the agrichemical industry. Although Kauai’s plight might seem like a local issue, this debate is in fact raging around the world as country after country is becoming concerned about pesticides, the future of food, and sustainable farming practices.